Pictured is Shane Barker, 39, of Harrogate Crescent, Breadsall, who has been jailed for nine months for damage, theft and harassment. A despicable man who stole from his nephew and threatened to hurt his sister’s young daughter has been jailed for nine months. Shane Barker, 39, of Harrogate Crescent, Breadsall, near Ilkeston, sent abusive texts to his sister accusing her of getting her son to report him to the police after the defendant had stolen property from his home. One of Barker’s texts also included a threat that he would use a blow torch on his sister’s daughter. Derby Crown Court, sitting at Derby magistrates’ court, heard on Thursday, March 23, how former arsonist Barker pleaded guilty to damaging a TV and stand at his nephew’s home, stealing two mobile phones and a silver chain from his nephew and he also admitted harassing his sister. Recorder Heidi Kubik told Barker: “You behaved in a way which you should be thoroughly ashamed. Your background given your antecedent past and the threats issued to your own sister as a result of police being notified were disgraceful and without excuse. Recorder Kubik added that the most disturbing aspect was the threat aimed by the defendant at his sister’s young daughter when he texted that he was going to use a blow torch on her feet. Prosecuting barrister Jonathan Dunne said the offending began after Barker had originally put up a Facebook message claiming his nephew was responsible for stealing from another sister and Barker went on to damage and steal goods from his nephew’s flat while he was away at his girlfriend’s. Mr Dunne added that after police enquiries were launched Barker went on further to send two insulting and threatening texts to his sister claiming she and her son had played a part in complaining about him to police. Barker who has 14 previous convictions with 42 offences including assault, damage, arson, theft, possessing an imitation firearm and harassment committed his latest damage, theft and harassment offences in December, 2016. 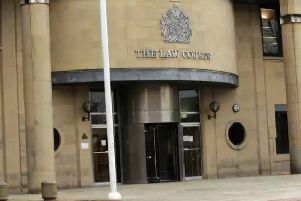 Emma Hodgson, defending, said the offences had arisen from a family dispute and the defendant had made empty threats and deeply regrets his actions. Recorder Heidi Kubik sentenced Barker to nine months in prison with time he has already spent on remand in custody since December 2016 to be included as part of the total sentence.